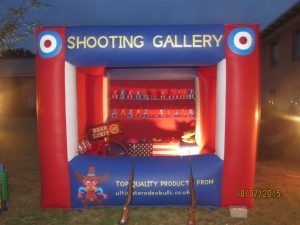 The Rodeo Bull or Rodeo Reindeer will add loads of excitement to any event with the Impressive Blow Up American Themed or Christmas Themed Bucking Bronco/Rodeo Reindeer Inflatable Bed to fall on to when you cant hang on any longer. The big impressive LED clock is split into two parts recording each contestant time at the top with the longest Rodeo Bull Rider time of the session showing at the bottom. During your event I will put the top 6 Rodeo times up on my Top Gear Star in a Car Scoreboard and the longest Rider of the day will be presented with the impressive inscribed Golden Bucking Bronco Trophy before the end of the event. Looking at holding a successful Rodeo Bull Event or Western Theme Event? RODEO BULL/BUCKING BRONCO PARTY or Event caters for any number of people of most ages. The Operator has the knowledge and experience to decide which Rides best suit which age groups as regards speed and complexity, changes in movements etc. A variety of Music is available at your Rodeo Bull/Bucking Bronco/ Western Themed Party from Western Themed music to 80s or 90s themed music—available upon request.